Three Good Design Awards were assigned to Falmec by the Chicago Athenaeum: Museum of Architecture and Design for the hoods Spazio, Quantum and Alba. 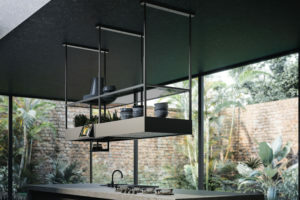 In the picture the Spazio model, designed by Francesco Lucchese: the 180 cm island supporting structure is equipped with comfortable smoked glass shelves to store crockery or any other useful object in the kitchen in an orderly manner. Besides, there is a channel equipped with hooks for the organization of the tools and an effective LED lighting system for the worktop. Spazio is realized with USB ports, electrical sockets (to recharge electronic devices) and a “tablet holder” to quickly and easily consult any application and recipes. The hood also offers the possibility of housing a small indoor garden designed for the cultivation of aromatic plants thanks to the presence of a light that stimulates photosynthesis. Quantum, instead, is the system that combines the extraction and cooking functions. The induction hob has a central extractor unit equipped with flaps that open automatically during the operations, and close at the end of them. Quantum presents the Flex Surface technology, 9 cooking levels and low noise thanks to the brushless motor. The Alba hood, finally, is built-in the ceiling. The projecting frame, made of glass, draws a transparent line that lights up using a LED system that runs through the entire perimeter of the hood. Alba is equipped with perimeter extraction.